These cards were produced for the National Safe Kids Campaign. These cards were a substitute for candy on Halloween. Many have original artwork exclusive to this set. Many cards could have been destroyed due to the nature of disbursal, and the limited Halloween season. SCARCE!!! These prism cards were from select vending machines. They were produced on Kodak paper and are die-cut. 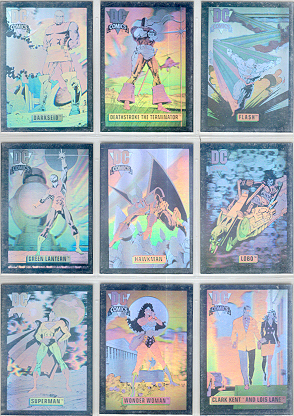 Most of the images resemble previous issued cards but have a prismatic appearance. The manufacturer is not revealed on card. Strangely enough, this company acquired the rights to have both DC and Marvel in the same set! Set size is unknown, but it is estimated at 15 card set. These cards have the same artwork from the set, but the backs declare "Thank You". All of the backs are the same; However, there may be as many as a complete set of card identical to the Era II set. We Stock thirteen different cards. SUPPLIES ARE EXTREMELY LIMITED. We stock about 100 different promo cards. Please email us with your wants and we will respond to your request.